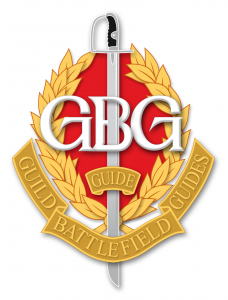 To define what makes a good Battlefield Guide and provide opportunities to demonstrate abilities in key guiding competencies, the Guild has developed a validation programme for Associate Members. On completion, the award of the Guild Accredited Member Badge and elevation to Accredited Guide status indicates that the holder is an experienced guide who has attained a peer verified level of professional expertise. Validation is not for all members and there is no obligation to participate in the programme. However those that do find it challenging and stimulating. Even guides with many years’ experience have found it both an opportunity for self-improvement and extremely rewarding! There are no validation failures, only passes or referrals. members graduate as Accredited Guides on completion of the Programme. The award of the Badge shows clients and potential employers that the holder has been formally prepared, assessed and registered in accordance with the Guild’s professional standards of knowledge and practice, and he/she is able to communicate their extensive knowledge in an interesting, informative and entertaining manner.